Whenever it starts raining ‘cats and dogs’ (and sheep) at a golf tournament, I think about course superintendents and the elements they’re battling. The 2009 U.S. Open at Bethpage Black was a case in point. Craig Currier, the superintendent at that time for the Bethpage State Park courses and now the super at Glen Oaks Club in Old Westbury, N.Y., performed one of the most amazing feats of course maintenance for a major championship. 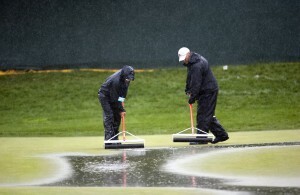 Beset by a near-Biblical deluge, Bethpage Black was a wet, soggy venue that kept attracting water like a divining rod. In fact, even before the Open, the course had seen rainfall on and off for nearly two weeks. And then during the first round the rains hit hard again, setting a new record of 1.53 inches at the Long Island Airport. But Currier, a Golf Course Superintendents Association of America (GCSAA) Class A member, led a staff of 60 and more than 150 volunteers (largely drawn from GCSAA members of the Long Island chapter) and they fought their way through the elements. Armed with squeegees, pumps, and water hogs, they battled to keep the course playable. Just one example: Newsday reported Currier arrived at the course at 2:45 a.m. on Sunday morning only to find the course “a mess.” With an expected round start of 7:30 a.m., the crew and volunteers arrived at 3 a.m. and worked on course prep until 5 a.m. when another downpour hit. “We got started, then it started raining again,” said Andrew Wilson, assistant superintendent for golf. “Having it ready by 7:30 was a pipe dream.” But later the rains subsided and the third round got underway on noon Sunday–following even more prep by the crew. Yes, Bethpage Black was later left somewhat defenseless at times due to the softened conditions but in the end only five players finished below par for the Open. One must credit Currier and his staff for their tireless efforts in making the Black a soggy yet still formidable test. The description that best summed up Currier– in fact, all those superintendents who battle and somehow overcome the elements–was one I read on the GCSSA website even before the Open began. It was uttered by architect Rees Jones who oversaw the renovations made to the Black for the 2002 and 2009 Opens and has worked closely with Currier for a long time.